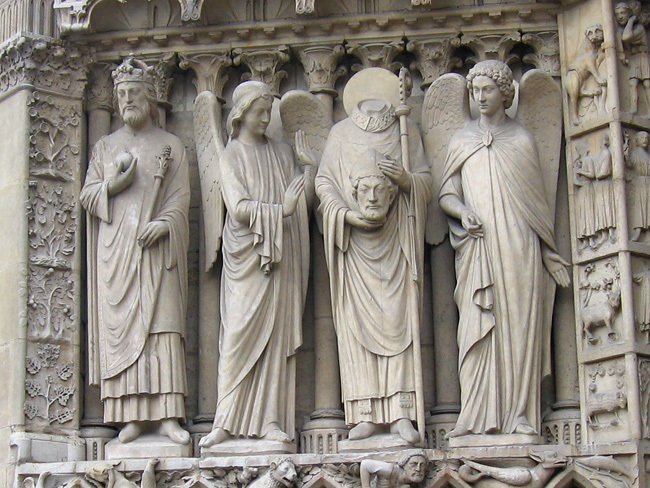 If, in your Paris wanderings, you've spent some time at Notre Dame admiring all the statues of saints and kings adorning the front of the cathedral, you may have found yourself wondering, "Who's that decapitated guy holding his head in his hands?" The headless man in question is Saint Denis, a martyr with a strange and incredible story. Here's Saint Denis on the front of Notre Dame. Three guesses which one is him. Saint Denis was the first bishop of Paris, back in the third century when Paris was still very much a Roman city. The prodigious number of conversions Denis performed got him on the bad side of the local pagan priests. So the Roman rulers of Paris had Denis arrested and brought him to the highest hill in Paris, now known as Montmartre, where he was executed by  you guessed it  beheading. Now, here comes the good part: It's said that immediately after Denis was killed, he picked up his head and walked six kilometers to the North, and then finally died. The spot where he fell is now the town (technically a commune) called Saint Denis. Once you've noticed Saint Denis and his distinctive neck stump on the front on Notre Dame, you may start seeing him here and there all over Paris. There are statues of Denis in lots of old Parisian churches, always in his easily recognizable pose. There's a great painting of him in the Pantheon, going after his rolling head as if he simply lost his hat in the breeze. 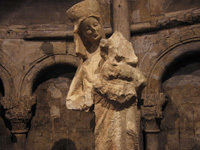 There's a beautiful gothic-era statue of Denis in the Musée du Moyen Age (aka the Cluny Museum). And there's also a more modern statue of him in a small park in Montmartre, probably not too far from where he was really killed eighteen centuries ago. The park is called Place Suzanne Buisson (map), and the entrance is on Rue Girardon, if you'd like to go have a look; it's a nice, quiet, peaceful square, tucked away from the otherwise-bustling streets Montmartre. I wrote a brief blog entry about this park (and a funny "no swimming" sign), here; you can see another statue of Denis here holding up his head like he's posing for a photo. A note about Saint Denis and the name Montmartre: Some folks translate Montmartre as "Mountain of the Martyr," referring to Denis and the unfortunate business of his chopped-off head, but in fact it's more likely the name comes from history that's even older than that. 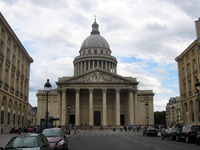 The hill is believed to have been originally called Mons Martis (Mount of Mars) in Roman times, and later in Christian times the name evolved into the Mount of the Martyr, or Montmartre, which meshes nicely with the story of Denis.